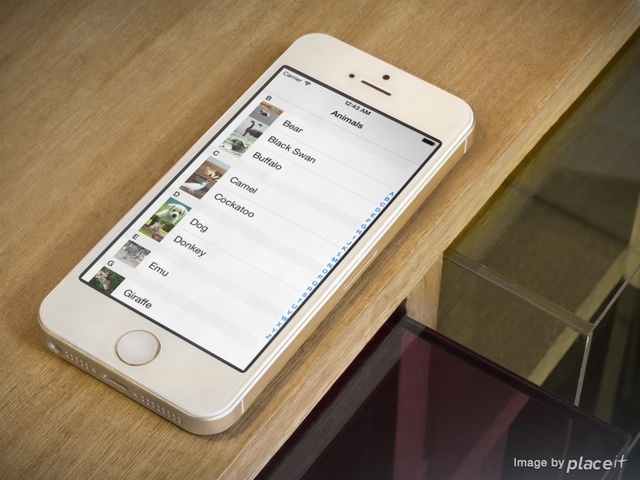 Recently, a reader asked me how to add an index list in a UITableView. As some of you may have the same question, I thought it’s better to write a post to share the solution. An indexed table view is more or less as the plain-styled table view that we’ve covered at the very beginning of our iOS programming course. The only difference is that it includes an index on the right side of the table view. Indexed table is very common in iOS apps. The most well-known example is the built-in Contacts app on iPhone. By offering an index scrolling, users are allowed to access a particular section of the table instantly without scrolling through each section. numberOfSectionsInTableView: method – returns the total number of sections in the table view. Usually we set the number of section to 1. If you want to have multiple sections, set this value to a larger number. titleForHeaderInSection: method – returns the header titles for different sections. This method is optional if you do not assign titles for the section. cellForRowAtIndexPath: method – this method shouldn’t be new to you if you know how to display data in UITableView. It returns the table data for a particular section. sectionIndexTitlesForTableView: method – returns the indexed titles that appear in the index list on the right side of the table view. For example, you can return an array of strings containing “A” to “Z”. sectionForSectionIndexTitle: method – returns the section index that the table view should jump to when user taps a particular index. There’s no better way to explain the implementation than showing an example. As usual, we’ll build a simple app together and you should get a better idea of index list in a minute. First, let’s see what we’re going to build for the demo app. It’s a very simple app showing a list of animals in a standard table view. 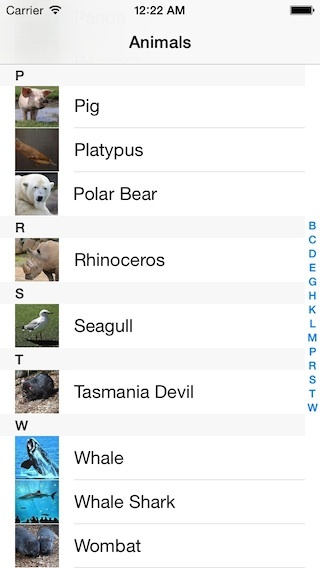 But this time, the app groups the animals into different sections and provides an index list for quick access. 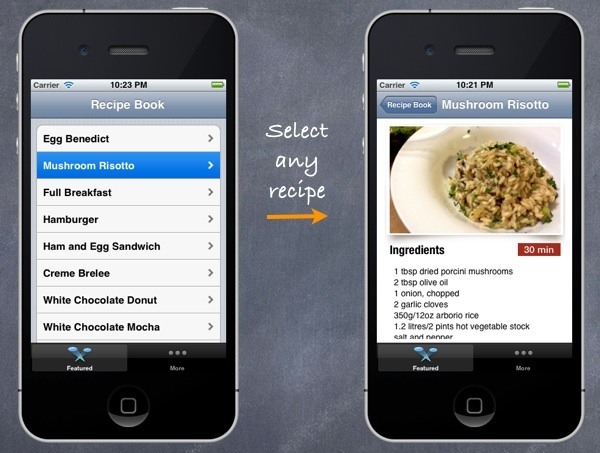 The below screenshot displays the final deliverable of the demo app. To work on the tutorial, you’re expected to have basic knowledge of UITableView. If not, stop right here and check out our UITableView tutorial first. The focus of the tutorial is on the implementation of sections and index list. Therefore, instead of building the Xcode project from scratch, you can download the Xcode project template from here. The template already includes everything you need to start with. 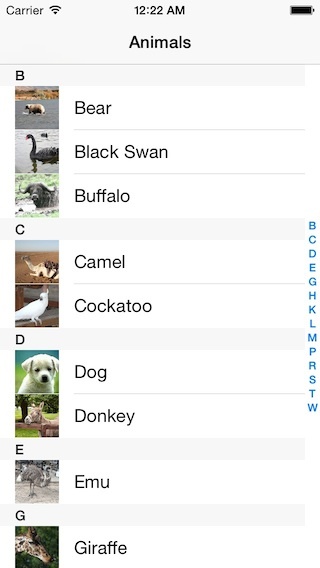 If you build the template, you’ll have an app showing a list of animals in table form as shown below. Later, we’ll modify the app, split the data into sections and add an index list to the table. In the above code, we create a NSDictionary for the animal variable. The first letter of the animal name is used as key. The value that associates with the corresponding key is an array of animal names. Additionally, we declare the animalSectionTitles array for storing the section titles. 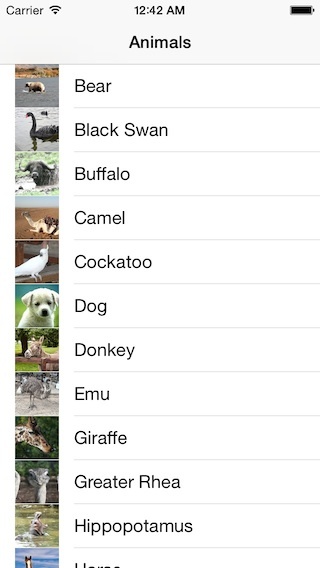 For convenience, we simply use the keys of the animals dictionary as the section titles. To get the keys of a NSDictionary, you can simply call the allKeys: method. On top of that, we sort the titles in alphabetical order. To display a header title for each section, we need to implement the titleForHeaderInSection: method. We simply return the section title based on the section index. When the app starts to render the data in the table view, the numberOfRowsInSection: will be called when a new section is displayed. Here based on the section index, we get the section title and use it as a key to retrieve the animal names for the section, followed by returning the total number of the animal names for that section. The indexPath contains the current row number, as well as, the current section index. Again, based on the section index, we retrieve the section title (e.g. 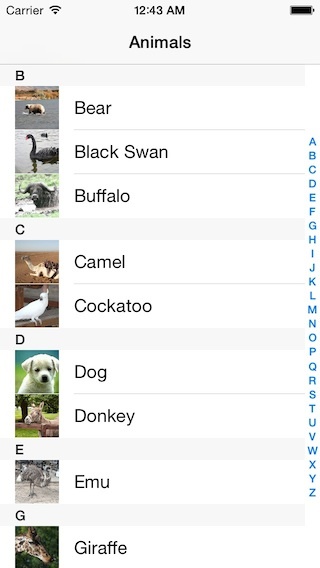 “B”) and use it as the key to retrieve the animal names for that section. The rest of the code is very straightforward. We simply get the animal name and set it as the cell label. The getImageFilename: method is a helper method bundled in the project template for handy retrieval of the image file name. Okay, you’re ready to go! 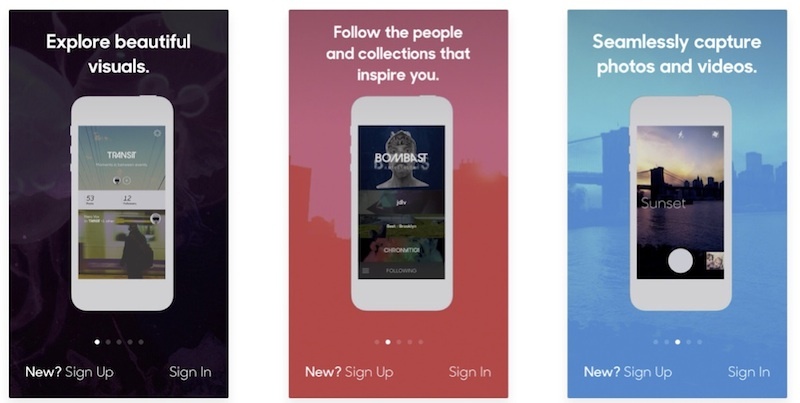 Hit the Run button and you should end up an app like this. So how can you add an index list to the table view? Again it’s easier than you thought and can be achieved by a few lines of code. Just add the sectionIndexTitlesForTableView: method and return an array of the section indexes. Here we use the section titles as the indexes. That’s it! Compile and run the app again. You should find the index on the right side of the table. Interestingly, you do not need any implementation and the indexing already works! Try to tap any of index and you’ll be brought to a particular section of the table. Next, change the sectionIndexTitlesForTableView: method and return the animalIndexTitles array instead of the animalSectionTitles array. Now, compile and run the app again. Cool! The app displays the index from A to Z. But wait a minute… It doesn’t work properly. Try to tap the index “C” and the app jumps to the “D” section. Based on the selected index name (i.e. title), we locate the correct section index from the animalSectionTitles. Compile and run the app again. The index list should now work! When you need to display a large number of records, it’ll be great to organize the data into sections and provide an index list for easy access. In this tutorial, we’ve walked you through the implementation of indexed table. By now, I believe you should know how to add sections and an index list to your table view. For your reference, you can download the complete Xcode project from here. As always, leave me comment and share your feedback about the tutorial. Excellent example, all your tutorial are great, i have a question or a propose to continue this tutorial.. how to do a round image like all the new design in IOS7, and a detail view..
Guys how can i go from this TableView to DetailView which include different content (in this case description on animals)? This is a great tutorial, can you do one on populating a uitableview using an sqlite database? I’ve dragged your classes and images into my own xCode project but unfortunately the program is crashing whenever I scroll down the table? It crashes on this line: NSArray *sectionAnimals = [animals objectForKey:sectionTitle]; I get a EXC_BAD_ACCESS error. Any ideas why this is happening? Also, the A to Z index does not appear? Anyone knows a tut EXACTLY like this, but implemented for core data? It’s a nightmare! I found some posts about this in various stackoverflow posts referring to transient properties and all that. But it seems people keep arguing about that. Some says that’s the way to do it, some says transient properties are nonsense, etc. I’d love to know if this can be implemented without transient properties and if so how. I have a problem: how could I set the width of the indexList? I’ve country names as section index titles like “Argentina”, or “Burkina Faso” or even longer, and it doesn’t look so good. Any solution to this? great tutorial. sectionForSectionIndexTitle does not work for me…can you help me? Do you have a tutorial that is like this but it enhances the data with a detail view when you click on the animal? Thanks a lot man, this is the best tutorial ever. simple and useful and not long. How cna i increase touchable range of alphabets at right side on tableview? how to change the color of that particular index title when i click to any index. is there a way to add subtitles to each animal by any chance? Great article, any links to a demo written in Swift? 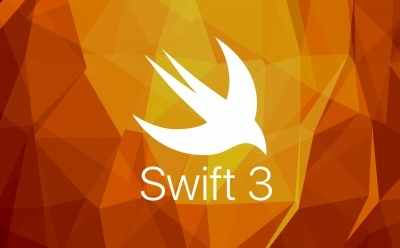 Can we have this tutorial for swift? Learn objc. You can’t do ios without knowing it. I respectfully disagree. Swift3 is already removing every part that resembles ObjC from Swift. I think a successful company will not maintain both languages. ObjC is outdated, not worth the learning curve and honestly it has no concept of modern programming. So I think I will stick with Swift and try to get better at it. Thanks for the tip, and I know it hurts all ObjC coders (because they went through hell to learn that language) but I think it is time to leave the boat. How can i use this code for listing contact of address book? Because some contacts have no name. Only phone number. So how can i manage this? Thanks a lot for this tutorial. It’s amazing. //go through the animals and create an array. //define the key for the animals. //create a new array and add it to the dictionary. Thank you so much for this reply, it remove unwanted letters from section which does not have data. Its very easy to follow tutorial, Good Job and thank you. FInal project isn’t there. Can you please add? Thanks, it still working on swift 4. I have tried implement this kind of section index list. Everything went fine in most basic case, except for the fact that I can’t find any ways to modify the default behavior of this built-in section index list. Or should I use another framework to modify the section index?